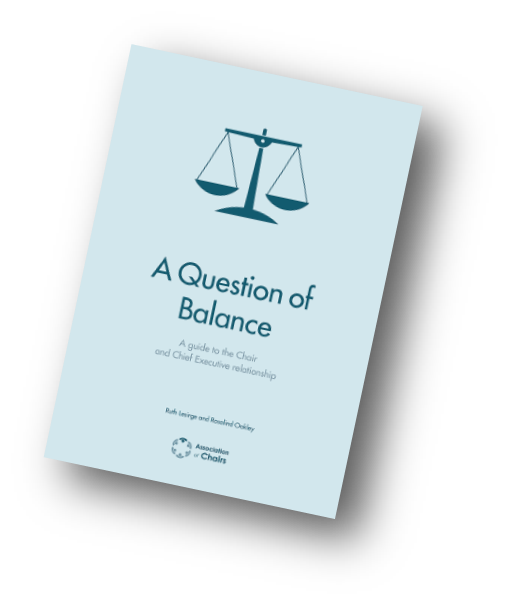 This guide helps Chairs to explore and strengthen the relationship they have with their CEO. Forging a successful relationship with your CEO is a key part of any chairing role. But it's not always a simple task. Each relationship is complex, dynamic and unique. It is vital that Chairs recognise the importance of the relationship and invest time, energy and effort in making it a success. provides pointers for when things go wrong. The guide is intended primarily for Chairs, both new and highly experienced, but will also be useful to Vice Chairs, trustees, CEOs and governance advisers. The guide has been made possible with the generous support of CCLA and Odgers Berndtson. It was first published in 2015. Please email us if you would like to buy a print copy for £25 (+ £3.50 for postage and packing). Members receive a 20% discount. Members representing organisations with an income over £5 million get a print copy as part of their membership. Find out how to join AoC. Members can also access a PDF copy here (if logged in). You can unsubscribe from our communication at any time. Our data privacy and protection policy can be found here.